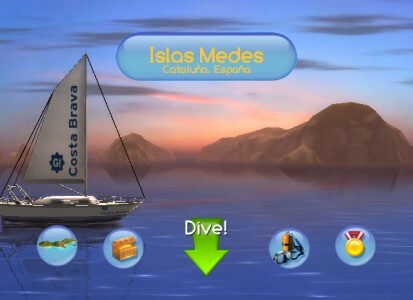 Dive: The Medes Islands Secret is Cosmonaut Game’s latest game made elusively for the Nintendo WiiWare. 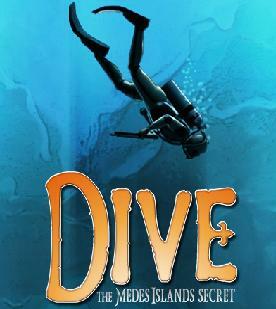 This unique title starts you out as John Sanders, the main character who is trying to discover all of the many secrets and treasures hiding in the Medes Islands deep underwater. Each time you dive underwater, you must search of a special artifact or treasure across 10 locations and avoid the dangers of the deep. John has a tranquilizer gun handy as well to protect himself against sharks, poisonous jellyfish and many more hazards lurking in the underwater fortress. The story mainly plays out through John’s log, which updates after each stage is completed in text format. The whole set-up is extremely simple but works well considering the story is not what really makes this game stand out. I was interested in each log though and had a sense of accomplishment with each level I finished as you learn more about the Medes Islands and the treasures you collect as you complete the game. I was really lost when I started actually playing Dive. I went in expecting more of an underwater exploring experience. I was half right in some ways, but also way off base on what I would find the more time I spent playing. You take control of John Sanders with the WiiMote. All you need to do is hold the B button down to move, pointing the WiiMote in the direction you need to go while using the A button to shoot a dart from your tranquilizer gun. When I first took off with Dive, like I mentioned I was a bit lost because I really didn’t know where to go or really where to start my adventure. You see, Dive: The Medes Islands Secret has a secret itself, most I think would pass it off as an underwater exploring game like I did at first, but underneath is a polished adventure game that is both challenging and rewarding. You are on an oxygen tank which depletes with damage taken or boosting for extra speed while swimming. Your dart gun is also your main protection which you can shoot at the marine wildlife to clear a path to go through. I ran out of darts and oxygen quickly, but the good news is you will be able to go to the shop and buy better equipment to fit each location’s layout. This is done through a currency system. Each time you find a treasure, you receive cash to spend later on at the shop. This method works well and any player should be able to quickly upgrade their way to their final wetsuits and equipment within the first half of the game. Most games in this day and age hold your hand while playing, giving you directions of your destination ahead or providing a linear map with a preset path to follow. Dive is completely different from any of that though, as through each world, you literally have to dive into the ocean and find your own path through the crevices and ocean flora and fauna to find hidden treasures and the main treasure of each level. There are also many ways to die though, from the marine wildlife like sharks, jellyfish, and even a giant octopus. Adding to that, many plants and other poisonous flora that cover the walls of the underwater world can damage you at even a simple brush through. Because of this, trial and error is the best way to make it through the dangerous landscape. If you try to hurry through the game, I can not see you lasting very long as every environment is set up differently so you really don’t know what to expect if it is your first time playing. I found the WiiMote to be precise on every movement I made and had no problem turning quickly or having to creep along side walls to avoid any dangerous fish or plants. The best way I could say how it plays out is kind of like the underwater levels in Donkey Kong Country, but imagine you have the controller to pull your character along and avoid the many perils of the sea. I found the whole set-up of how Dive played out to be innovative and original while also providing a decent challenge and requiring quite a bit of planning and strategy. 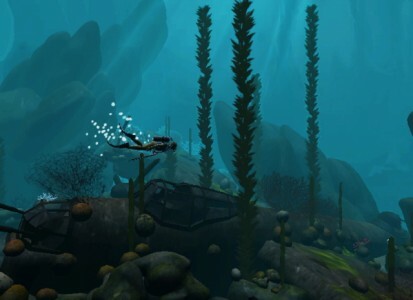 The music in dive is fully orchestrated and is fitting with each underwater level. There are many different tunes that will play based on the situation you are in underwater. Every piece played brings life into the environments and enhances the feel for your surroundings bringing a more realistic experience. Sound effects are great as well for the most part, but I did feel some of the warning alerts were a bit loud and overshadowed the music in the game. 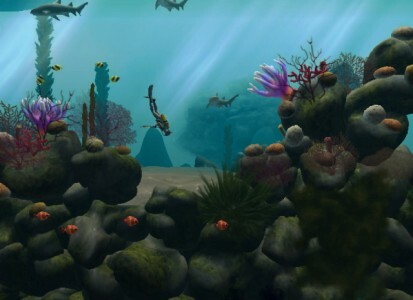 The main part of any underwater game though is to feel like an underwater game, and the music and sound effects did just that, with the water sounds to the sounds of the main character and other wildlife swimming through the ocean. The graphics are also stunning and really make this ocean landscape come alive. From a simple patch of coral to the moss on the rocky walls, every location is beaming with life and fully detailed which makes it easy to lose yourself in the game’s many environments. There is also plenty of color and movement going on while you explore the depths of the seafloor with fish swimming around in schools and Jellyfish slowly drifting through the sea. The darker locations run nicely, but some might find the torch provided for these areas to be too dim to see some of the dangers ahead. Besides that, I noticed no lag or any hiccups while playing and everything ran smooth and seemed to flow perfectly around my character which enhanced the experience even more. I truly do not think this title is for certain gamers out there. Patience and trial and error play a huge role in every movement you make in “Dive”. My experience was completely unexpected as the gameplay offered something original and unique. The game was around 6 hours and each location was large and brought something new each time. Also adding to the replay value is various achievements you can aim to complete by accomplishing certain tasks in the game. 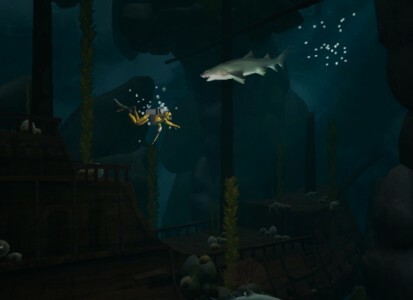 For those who just want an ocean game to play I would recommend this game for the scenery of the oceanic environments alone, but for those who want something with an interesting and rewarding story as well as a great soundtrack and challenging gameplay, give Dive: The Medes Islands Secret a try. While there are a few flaws in this game, but the full experience makes this title feel realistic and worth the price of admission.